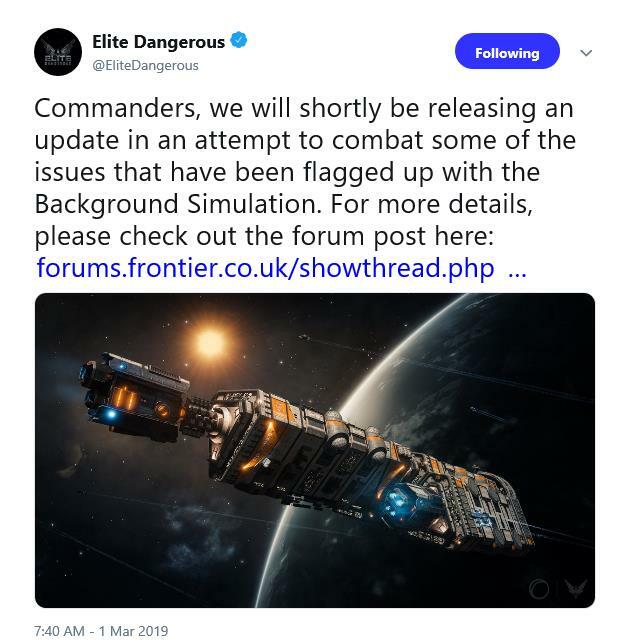 Frontier Development took to the Frontier Forums this morning to announce plans to roll out some changes to fix issues that continue to pop up in the Background Simulation in Elite Dangerous. The servers will be going offline at 8:30 am EST this morning to make the updates. You can read all of the updates and reasoning here (or after the jump), but most updates are having to do with the Factions, conflicts and balancing how they all interact together. There is not a confirmed downtime for the update, but once the game servers come back online, expect some changes to your welcoming committees as you roll into space stations. Before that, we would like to thank all of your who shared your feedback on the forums, across social media and on Discord since the release of Beyond - Chapter Four. With these reports, we were able to identify issues with the simulation and while we could not reply to each of you individually, please rest assured that we have read your feedback and investigated details in the galaxy's databases and server logs where possible. As we've mentioned previously, this is an on-going process, so some tweaks and changes are still likely to come as we release more updates of the BGS. We've been taking a really in-depth look at how all of the galaxy's factions have reacted to having multiple states active at once and to how the galaxy reacts to each and every player action in the core of the background simulation, and are ready to release some more changes to the live game servers today from 1:30 PM (UTC). While we don't usually put changes like these out on a Friday, we've heard your feedback and believe it is better to give you the weekend to try out them out and provide any feedback you might have. Next week, we'll be able to take a look at your comments and assess the impact these revisions have had. Most cases reported - where you had performed a lot of positive influence actions to a given faction, but saw minimal increases or even a decrease: this is due to the way the system distributes influence and has to keep everything at 100% maximum (this can be lower when some factions in the system are in a conflict). After extensively analysing the live galaxy's data and logs, we have re-balanced equations which convert player actions into influence. The Outbreak state no longer breaks War and Civil War scoring. From Beyond - Chapter Four, Faction Conflicts were changed to run for a fixed duration, keeping a daily 'score' for each faction, and then the overall Conflict result was determined by the number of days that a given faction 'won'. The days won are announced in the faction status local news articles in that starsystem. To reduce the number of Conflicts in the galaxy and to make them more meaningful, Conflicts will now only be triggered during invasions or when one or both factions control an asset that's at risk by that Conflict. Previously, the day's score was determined by diverting faction influence inputs (subject to the usual rules of combat actions affecting War and Civil War and non-combat actions affecting Elections). However, we've now changed faction Conflict scores to be driven by their own set of equations. We've kept the relative balance of how each action is weighted against others, but it should now be much harder to lose a day in a Conflict by accidentally putting positive inputs into your opposing faction. This also fixes some of the strange influence changes that some of you reported on the tick when a Conflict ended. To be clear, influence changes after any Conflict should be the ±4% change. This is designed to separate the winners and losers of a Conflict, so that it doesn't immediately restart. Conflicts will now end earlier if there aren't enough days of the Conflict remaining for the losing faction to at least achieve a draw. We've already made a several changes for how negative actions apply negative economic and security effects, and also how quickly the EP & SP bars drain back towards the centre. We expect to make further tweaks once we've analysed the results of this set of changes.